Simple Knitting is a unique workshop-based, how-to-knit book that will teach you the key techniques while creating an enviable collection of knitted items. Each of the 20 projects in the book teaches a new skill, as well as building upon and consolidating those knitting techniques already learned through preceding projects. With a series of workshop-style masterclasses EriSimple Knitting is a unique workshop-based, how-to-knit book that will teach you the key techniques while creating an enviable collection of knitted items. 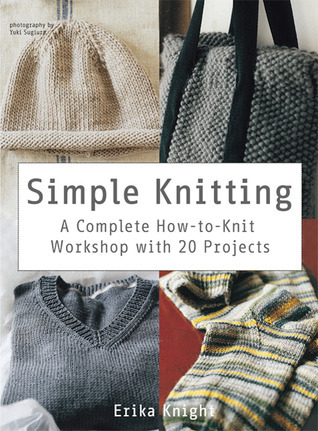 Each of the 20 projects in the book teaches a new skill, as well as building upon and consolidating those knitting techniques already learned through preceding projects. With a series of workshop-style masterclasses Erika Knight explains all the essential information--from achieving a perfect tension and substituting yarns or stitch textures, to more advanced cables and shaping--alongside broader design principles, such as building a color palette.Providing a unique opportunity to learn the design secrets of one of the world's most highly-respected knitwear designers, Erika shares her special tricks of the trade within this book. Erika's signature style, for which she has become renowned worldwide, is her sophisticated simplicity. Simple Knitting is the embodiment of that elegant reductivism. Her designs prove that you can make wonderful, original items for your home and yourself at the same time as mastering a repertoire of skills. Likewise, her preference for a refined natural palette of earthy shades with the odd highlight hue is perfectly in tune with the current mood for relaxed, homely interiors.With inspiring photography by Yuki Sugiura that showcases each of the beautiful designs, supported with clear charts and artwork, Simple Knitting is the ultimate learn-to-knit book.